Kumbakonam, famous as the temple city of the Southern part of India, it is located in the Tanjavur district of Tamil Nadu. Surrounded by two rivers- Cauvery and Arasalar, on either side, it is one of the most ancient towns of the state of Tamil Nadu. It also plays host to the Mahamaham festival after every 12 years. In the course of its history, it has been under the rule of various dynasties such as Cholas, Vijayanagar Empire, Pandayas, Nayaks, Marathas and lastly, the British Empire. Various rulers were not only patrons of erecting beautiful temples but also erected several amazing forts and palaces, which after the abolition of privy purses have now become heritage hotels in Kumbakonam. Opt to stay in these magnificent properties, and enjoy a luxurious pampering like the kings and queens of the olden times. Through Heritage Hotels of India, you can now make a booking without leaving the comfort of your home. Enjoy a comfortable stay in this heritage property that is well-appointed with all kinds of world-class modern amenities and services. 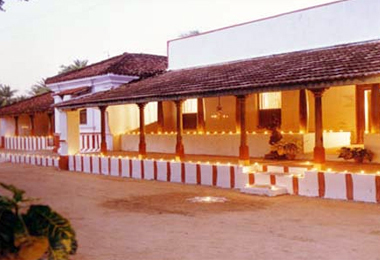 This old heritage house has been re-modeled to suit the needs of the discerning tourists of today. During your stay, enjoy sumptuous local delicacies.